In The Spotlight: My Bookmarks. So with all the time that we spend on the internet, I’m sure there are many of you guys have ‘bookmarks’ or shortcuts to the sites that you might visit pretty frequently to see if there are any updates or new news too read up on. This post is about the sites that I frequently read whenever I find myself at the computer. These are the sites/blogs that I go too whenever I need some inspiration or just need to read something interesting and new. My Favorite Blog about all the happenings in Spain. This is probably the one blog I visit the most. The author has created such a great way for readers to feel like they can experience Spanish cuisine from wherever they are reading it from. For the past year and the half, I have been making sure to come by every single Tuesday of every single week to read their weekly post called ‘365 Tuesday’, which was formely known as ‘Pintxo Astearteak’, or, ‘Tapas Tuesdays’. Tapas Tuesdays were probably the single best thing about my Tuesdays. Even though the only thing the blog post consisted of was a picture and the description of the dish, it was was something I always looked forward to every week. The thing I really enjoy about these posts were how sophisticated it would be for how simple the post really was. Each dish for each Tuesday was specifically chosen for a reason. And that reason is because it was that damn good and seeing each dish makes me so envious that there is no where close to where I am to experience it. After working at Txori (RIP), I have found a love for pintxos so this blog was a great influence on me and the ideas I have while working in the kitchen. 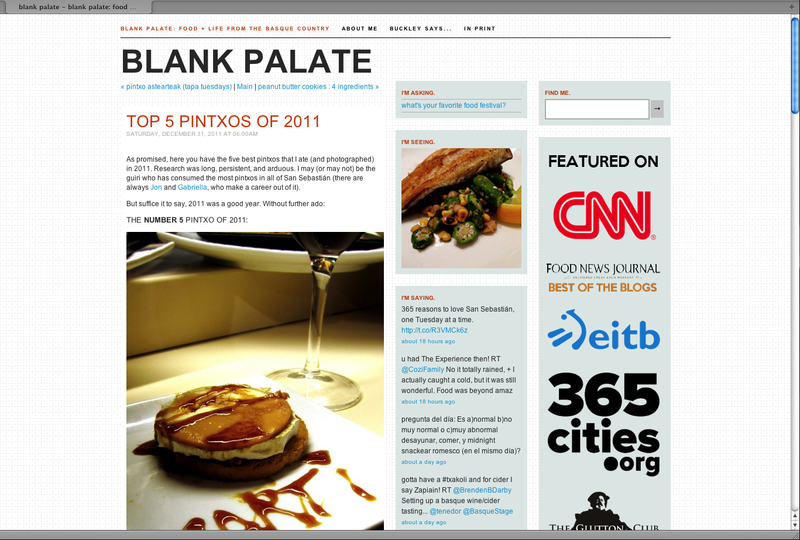 Here’s a link to her Top 5 Pintxos of 2011. When the new year started, she has changed Tapas Tuesdays to 365 Tuesdays which doesn’t just focus on tapas anymore, but broadens it’s focus on what is currently happen all around San Sabastian. It’s a great change and I definitely enjoy it just as much as Tapas Tuesdays! These are two great blogs for those new and also very familiar with Filipino cuisine. I’ve grown up eating Filipino food but I feel like I still learn so much about this cuisine I thought I already knew. Burnt Lumpia is a great blog where the author really shows his personality through his posts. He gives a great perspective about what Filipino food is to him and I find it easy to relate to who he is and what he is trying to portray. He is currently in the works for making a new Filipino Cookbook so it’s been a great time following his blog and seeing the progress he is making. Jun-blog is a great reference for those who are new to Filipino food. I really like the fact that they have a ‘Glossary to Filipino Cuisine’ that outlines some of the most basic and foundations to Filipino food. The blog is nominated for one of Saveur’s Best Food Blog Awards in the Best Regional Cuisine Blog. It’s an amazing thing to be nominated for such an award and it makes me proud that a blog can represent my culture and its food in such a great way. They say music makes the world go round and I couldn’t agree more. Whenever I need to find some new tracks to put on my phone I look to Fresh New Tracks to find any new music that had just came out. They have a good variety of music to listen to and also gives you a download link to put on your computer. Absolutepunk is a website that I have been following ever since I was in middle school and it feeds my inner-teenage angts with the latest news on not just punk-oriented music, but music of a wide variety. This is my main source of upcoming shows, rumors going on with the music industry, and when new albums are about to drop. If there is one thing that Staci and I like to do more its watch movies in the theaters. Comingsoon is my go-to website whenever I want to know about upcoming movies and any movie news about movies that we are excited about. I also am a huge video game nerd so IGN fills my needs when it comes to video game news. These are the blogs and websites that I check and I got to say that they really have an influence on my everyday life. As much as I try not to sit in front of the computer screen, at least I know that there are places I can go to occupy my time and find out something new that I can share with people. 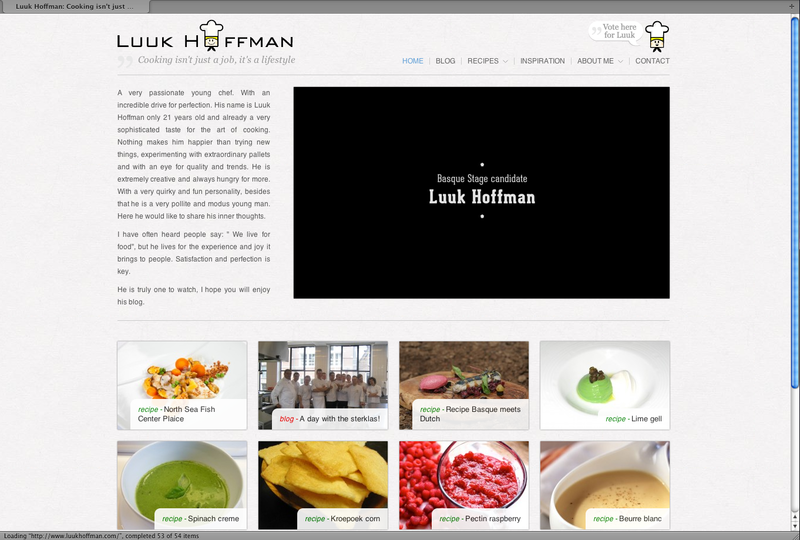 Gotta give my new found friend from the Netherlands, Luuk Hoffman. This is his blog and I got to say that even though he is competition of mine, that he has some pretty amazing stuff. He is only 21 and he has a sophisticated touch when it comes to cooking. I have found so much inspiration from this guy and am pretty excited for all of the things he does and will do. He is someone that everybody should keep an eye out because he’s going to be doing big things! Thank you guys again and until next time!